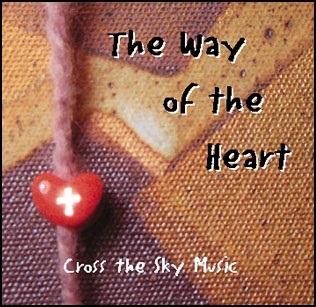 The Way of the Heart is a collection of 15 original songs from Cross the Sky Ministry written to provide the backdrop for a mime drama – a story about following God’s heart and walking in the way of Christ. The mime drama is perfect for a youth group to perform in church, for a family night, or as a special presentation for the Sunday School. The mime booklet has everything you need to get up and running. “The Way of the Heart” is a dramatic presentation that focuses on the teachings of Jesus Christ and what it means to follow him in our daily lives. The scenes focus on a number of faith issues including: fear, doubt, temptation, peer pressure, the suffering of Christ, his death and resurrection, and the call of Christ to reach out to those around us. The purpose of the mime drama is to inspire and challenge viewers to rediscover a deeper walk with their Lord and Savior Jesus Christ. A song asking God to change the way we live to become more focused on the things around us. A prayer of hope for the light of Christ to illuminate our hearts to shine as a witness to our faith in God. An inviting declaration about Christian community and who we are called to be as the body of Christ. Choose a complete package or single item from the menu below and select Add to Cart. For permission to photocopy the mime booklet, add the copyright use fee to your order. $3.00 shipping will be added per line item for online orders. We ship via priority mail.